The SL line has undergone a refreshing for the 2009 model year. A new single-bar grill is flanked by L-shaped headlamps. Overall, cars have a chiseled, edgier look up front. Side-fender “air gills” behind the front wheels have been added as both a nod to the SL's Gullwing past and as functional engine-compartment hot-air extractors. Other external changes, like larger side mirrors and trapezoidal exhaust tips, are minor. 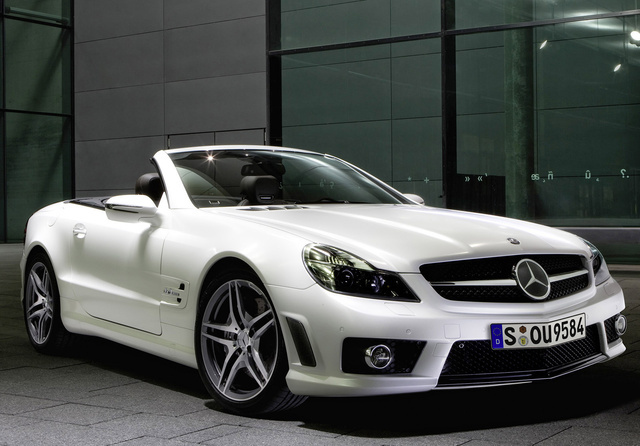 The SL550 – the most popular SL model – arrives with a 5.5-liter naturally aspirated V8 that produces 382 hp. Backed by a seven-speed automatic transmission, the SL550 can trip across the 0-60 jump in 5.3 seconds according to Mercedes’ conservative numbers, though one reviewer managed it in 4.9 seconds. The seven-speed automatic gets enthusiastic reviews for shifting “imperceptibly.” The transmission incorporates driver-adaptive programming that adjusts shift points to the driver’s driving style. The manual-shift mode works via a shift lever or steering-wheel-mounted paddles. Handling throughout the SL class is worthy of its impeccable sports car heritage. All models feature Mercedes’ remarkable Active Body Control System (ABC) that employs airsprings, driver-controlled dampers, and solid chassis construction. Reviewers were all impressed with the flat cornering and comfortable cruising afforded by the SL550. The interior is opulent, as would be expected in this price range. Occupants are treated to yards of soft leather, burnished wood finishes, and tasteful chrome trim. The interiors are customizable with seemingly myriads of leather and wood trim combinations. Seats are great, with one reviewer claiming he could sleep in them, which could be dangerous in this car. The SL550's cockpit includes plenty of creature comforts, including the Airscarf feature borrowed from the SLK line – fans located in the headrests blow warm air down passengers' necks to extend the top-down driving season. Reviewers report that with the top down, the roadster is quiet enough at 100 mph for normal-volume conversations - putting it down takes only 16 seconds, as the two-piece hardtop folds away into the 10.2-cubic-foot trunk, reducing it to 7.2 cubic feet. Brakes are powerful and fade resistant. Steering is managed by a new variable-ratio system that activates more the further the wheel is turned. Reviewers report that although the steering’s road communication is far from the Porsche experience, it's well suited for an ultra-luxury touring roadster. Mercedes claims that the solid-roof roadster is “the world’s safest convertible.” Objectively, the SL class has received top “good” ratings in all IIHS tests and a four-star frontal rating for the driver and five stars for all the other NHTSA tests. Safety features include ABS antilock brakes, a sophisticated electronic stability system, a full compliment of airbags including a driver’s knee airbag, popup roll bars, and active head restraints. The SL Class has been and continues to be one of the most prestigious and gratifying luxury performance sports cars. Beginning with the fabulous 300SL Gullwing in 1954, the Mercedes Benz SL Class has been one of the most honored in automotive history. It has also been one of the most successful, having sold more than 634,000 SL cars over the years. For 2009, the folding-hardtop SL63 AMG roadster remains a limited-production high-performance machine. The SL line has undergone a refreshing for the 2009 model year. A new single-bar grill is flanked by L-shaped headlamps. Overall, cars have a chiseled, edgy look to the front end. Side-fender “air gills” behind the front wheels have been added as both a nod to the Gullwing past and as functional engine-compartment hot-air extractors. Other external changes, like larger side mirrors and trapezoidal exhaust tips, are minor. Interiors are customizable, with a wide variety of leather and wood trim combinations. AMG versions have undergone minor external refreshing, including a lower, more aggressive front air intake, grille and headlight revisions, special side skirts, and a new rear fascia. This high-performance SL is equipped with a 6.2-liter naturally aspirated V8 that spins out 518 hp and 465 lb-ft torque through a seven-speed AMG-modified automatic transmission. AMG rates the 0-60 jump at 4.3 seconds. AMG engineers modified a seven-speed Mercedes transmission by replacing the torque converter with a wet clutch. Five rotary-dialed shifting modes are available: comfort, sport, sport plus, manual (using either the shift lever or steering-wheel paddles), and launch control. In sport plus mode, shifts are faster than sport mode and more revs are added to the downshifts. The transmission is the closest thing Mercedes has to an automatic manual transmission – Audi and BMW use twin-clutch, twin-shaft gearboxes, which are heavier. The SL63 AMG's handling is worthy of its impeccable sports car heritage. It feature Mercedes' remarkable Active Body Control System (ABC) that employs airsprings, driver controlled dampers, and solid construction. AMG massaged the SL63 by adding racing-level technology to the suspension bits, allowing an even higher level of handling performance. SL63 AMG interiors are not forgotten, being as opulent as would be expected in this price range. Occupants are treated to yards of soft leather, burnished wood finishes, and tasteful chrome trim. Seats are so comfortable one reviewer claims he could sleep in them, which could be dangerous! The cockpit includes plenty of creature comforts, including the Airscarf feature borrowed from the SLK line – fans located in the headrests blow warm air down passengers' necks to extend the top-down driving season. Reviewers report that the roadster is quiet enough at 100 mph with the top down for normal conversation levels - putting it down takes only 16 seconds, as the two-piece hardtop folds away in the 10.2-cubic-foot trunk, reducing it to 7.2 cubic feet. Brakes are powerful and fade resistant. Steering is managed by a new variable-ratio system that activates more the more the wheel is turned. Reviewers reported that although the steering’s communication with the road is far from the Porsche experience, it is well suited for an ultra-luxury touring roadster. Mercedes claims that the solid-roof roadster is “the world’s safest convertible.” Objectively, the SL class has received top “good” ratings in all IIHS tests and a four star frontal rating for the driver and five stars for all the other NHTSA tests. Safety features include ABS antilock brakes, a sophisticated electronic stability system, a full complement of airbags, including a driver’s knee airbag, popup roll bars, and active head restraints. The SL63 AMG has been and continues to be one of the most prestigious and gratifying luxury performance sports cars. The SL line has undergone refreshing for the 2009 model year. A new single-bar grill is flanked by L-shaped headlamps. Overall, cars have a chiseled, edgier look to the front end. Side-fender “air gills” behind the front wheels have been added as both a nod to the SL's Gullwing past and as functional engine-compartment hot-air extractors. Other external changes, like larger side mirrors and trapezoidal exhaust tips, are minor. The SL600 raises the performance bar by bolting a twin-turbocharged 5.5-liter V12 with 510 hp and 612 lb-ft of torque under the hood. This powerhouse is capable of launching the hefty roadster across the 0-60 jump in 4.4 seconds, according to Mercedes. Some reviewers, however, have complained about turbo lag. To handle the increased torque, Mercedes employs a five-speed automatic transmission, which gets enthusiastic reviews for imperceptible shifting. The transmission incorporates driver-adaptive programming that adjusts shift points to the driver’s driving style. The manual-shift mode works via a shift lever or steering-wheel-mounted paddles. Handling is worthy of its impeccable sports car heritage. The SL600 features Mercedes' remarkable Active Body Control System (ABC), which employs airsprings, driver-controlled dampers, and solid construction. Reviewers were all impressed with the flat cornering and comfortable cruising afforded by the SL600. The interior is opulent, as would be expected in this price range. Occupants are treated to yards of soft leather, burnished wood finishes, and tasteful chrome trim. Interiors are customizable with seemingly myriad combinations of leather and wood trim. Seats are great, with one reviewer claiming they are so comfortable he could fall asleep in them, which could be dangerous in this car. The SL600 cockpit includes plenty of creature comforts, including the Airscarf feature borrowed from the SLK line – fans located in the headrests blow warm air down passengers' necks to extend the top-down driving season. Reviewers report that with the top down at 100 mph, normal-volume conversations are possible - putting it down takes only 16 seconds, as the two-piece hardtop folds away in the 10.2-cubic-foot trunk, reducing it to 7.2 cubic feet. Brakes are powerful and fade resistant, and the steering employs a new variable-ratio system that activates more the further the wheel is turned. Reviewers report that although the steering’s road communication is far from the Porsche experience, it is well suited for an ultra-luxury touring roadster. Mercedes claims that this solid-roof roadster is “the world’s safest convertible.” Objectively, the SL class has received top “good” ratings in all IIHS tests and a four-star frontal rating for the driver and five stars for all the other NHTSA tests. Safety features include ABS antilock brakes, a sophisticated electronic stability system, a full compliment of airbags including a driver’s knee airbag, popup roll bars, and active head restraints. For 2009, the folding-hardtop SL65 AMG roadster remains a limited-production machine that represents the performance peak for Mercedes' SL Class. The SL line has undergone a refreshing for the 2009 model year. A new single-bar grill is flanked by L-shaped headlamps. Overall, cars have a chiseled, edgier look to the front. Side-fender “air gills” behind the front wheels have been added as both a nod to the Gullwing past and as functional engine-compartment hot-air extractors. Other external changes, like larger side mirrors and trapezoidal exhaust tips, are minor. Interiors are customizable with a wide variety of leather and wood trim combinations. AMG versions have also undergone minor external refreshing, getting a lower, more aggressive front air intake, grille and headlight revisions, special side skirts, and a new rear fascia. As the pinnacle of SL performance, the SL65 AMG is powered by a twin-turbocharged 6.0-liter V12 that rips out 604 hp and an amazing 738 lb-ft of torque. Flowing through a five-speed automatic, the SL65 blasts across the 0-60 jump in 4.2 seconds, according to AMG, though one independent review gives 3.9 seconds. Several reviews, however did point to issues of turbo lag. The SL65 AMG's handling is worthy of its impeccable sports car heritage. It features Mercedes' remarkable Active Body Control System (ABC) that employs air springs, driver-controlled dampers, and solid construction. Reviewers were all impressed with the car's flat cornering and comfortable cruising. AMG's workover adds racing-level technology to the suspension bits, allowing an even higher level of handling performance. The SL65 AMG's interior is opulent, as would be expected in this price range. Occupants are treated to yards of soft leather, burnished wood finishes, and tasteful chrome trim. Seats are so comfortable one reviewer claims he could sleep in them, which could be dangerous in this car! The cockpit includes plenty of creature comforts, including the Airscarf feature borrowed from the SLK line – fans located in the headrests blow warm air down passengers' necks to extend the top-down driving season. Reviewers report that the roadster is quiet enough for conversation at 100 mph with the top down - putting it down takes only 16 seconds, as the two-piece hardtop folds away into the 10.2-cubic-foot trunk, reducing it to 7.2 cubic feet. Brakes are powerful and fade resistant. Steering is managed by a new variable-ratio system that activates more the more the wheel is turned. Reviewers report that although the steering’s communication with the road is far from the Porsche experience, it is well suited for an ultra-luxury touring roadster. Mercedes claims that this solid-roof roadster is “the world’s safest convertible.” Objectively, the SL class has received top “good” ratings in all IIHS tests and a four star frontal rating for the driver and five stars for all the other NHTSA tests. Safety features include ABS antilock brakes, a sophisticated electronic stability system, a full compliment of airbags including a driver’s knee airbag, popup roll bars, and active head restraints. The SL65 AMG represents one of the most prestigious and gratifying luxury performance sports cars.